President Trump declared the opioid crisis a "public health emergency" — but didn't call it a national emergency. 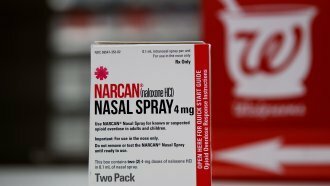 On Thursday, President Donald Trump declared the opioid crisis a "public health emergency" — a step that doesn't quite go as far as declaring it a national emergency. "For too long, we have allowed drugs to ravage American homes, cities and towns. We owe it to our children and to our country to do everything in our power to address this national shame and human tragedy," Trump said. The declaration lets states shift certain funds toward opioid addiction and gives rural residents easier access to prescription treatment. But it doesn't open up the same federal funding that declaring a national emergency would have. This doesn't necessarily mean the Trump administration thinks drug abuse is a minor issue. The reason for not calling a national emergency may have more to do with where funding would come from. If Trump had called the crisis a national emergency, money would've been moved from the Federal Emergency Management Agency's funds — but CNN notes a senior administration official said FEMA's money should go to disaster relief, not health crises. Trump said Thursday that he's still planning to take more actions to help individual states. "A number of states have reached out to us asking for relief, and you should expect to see approvals that will unlock treatment for people in need. And those approvals will come very, very fast, not like in the past," Trump said. Still, Trump's public health emergency may prove controversial, since he previously said he would declare a national emergency.